When Brian was in high school, he started hearing voices. Sometimes he still does. The voices usually sound like one of his friends. Their favorite subject is money. They don’t tell him to do anything bad but in fact usually provide sound financial advice. 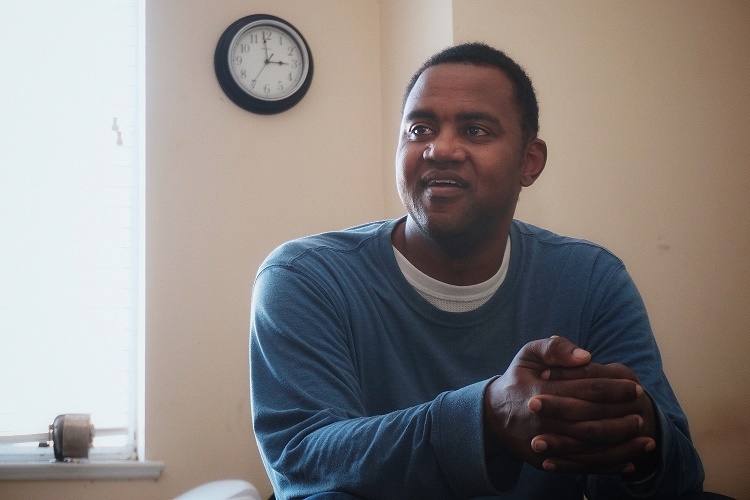 When he was still homeless, these voices, Brian believes, were essential to his survival. But Brian is homeless no longer. He has lived at McCreesh Place since 2012, where he is known by everyone for his strength and kindness. With his survival no longer in question, and his schizophrenia effectively managed, the voices, when they speak at all now, focus on more minor financial topics—such as whether to return a book he purchased. “They all know me at Barnes and Noble,” he says. Not only is Brian a scholar—he is also an athlete. At Geneva College, he was equally the star of his philosophy classes and the basketball team. He moved to Germany to play professional basketball after he completed a practical degree in accounting. However, neither accounting nor professional basketball were good career fits. The former involved too much time sitting and inside his own head, while the latter required too much time spent being yelled at by his coach. Perhaps telling of his true passions, Brian’s fondest memory of his time in Europe does not involve basketball at all but rather a side trip to Paris which on the surface sounds disastrous. His reason for going to Paris was to celebrate Mardi Gras. But while everyone else was partying, Brian spent four days straight in the Louvre. Immersed in the artwork, he lost track of time, so that when he came to his senses, not only his money but also his bus back to Germany were long gone. For better or worse, it was looking like Brian might be stuck in the Louvre forever. Fortunately, he was able to make friends with a man who hopped trains. Ever the quick study, Brian hopped a train back to Germany. After maneuvering to the main cabin, he felt conspicuous in the non-train-hopping European crowd. To blend in, he smoked a cigarette, even though he doesn’t smoke. Then he put his Bible under his arm and fell into a deep sleep—only to awake eight hours later at the correct train station in Germany. If he had not woken up, he jokes, he would probably still be stuck somewhere in Eastern Europe. More recently, he took the Myers-Briggs Personality Assessment and learned that he was the rarest type of them all: an INFJ. Digging into his profile, Brian was not at all surprised to discover that they make great counselors and helpers. That was all the confirmation he needed to crystallize a new career direction. With the support of his Case Manager, his goal is to become a Peer Support Specialist. He wants to work with people who feel alone and misunderstood—because, as the rarest personality type, as a man who has struggled with homelessness and mental illness (and the proper order in which to read the Western Canon), Brian has often felt that way himself. He has emerged from all this, however, as a pillar of strength and kindness in the McCreesh Community. He says he is ready to move on and give back. The truth is: he has already given so much.